I was shopping at our local Target the other day and came across some whale shaped cheddar crackers and that inspired this easy to make bento. 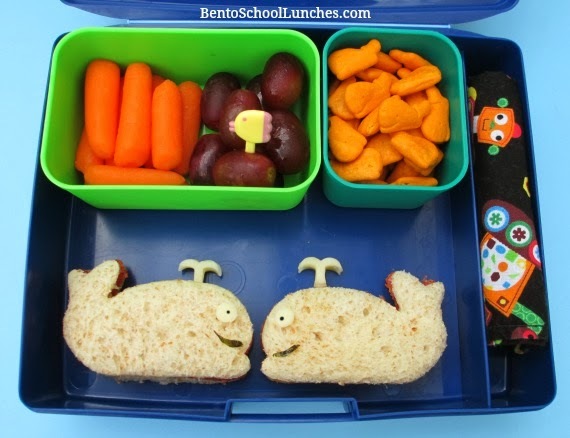 Whale shaped sandwiches made with cutter, Provolone cheese coming from blow-hole and for eyes, and nori for mouth and eye. Upper left: Baby carrots and seedless red grapes. Upper right: Whale shaped cheddar crackers. Far right: Cloth napkin. This lunch is packed in his Laptop Lunches.